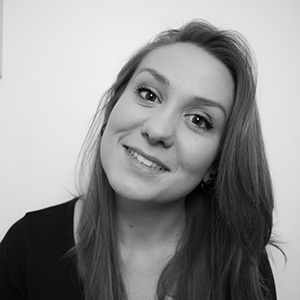 The Third Thumb Project from Dani Clode on Vimeo. The Third Thumb instigates a necessary conversation about the definition of ‘ability’. The origin of the word ‘prosthesis’ meant ’to add, put onto’; so not to fix or replace, but to extend. The project is inspired by this word origin, exploring human augmentation and aiming to reframe prosthetics as extensions of the body. Prosthetics are such unique products; it is a human-to-product relationship that is unlike any other. I wanted to really explore this connection that evolves between the wearer and the limb, so I developed the design to be able to be experienced by anyone. 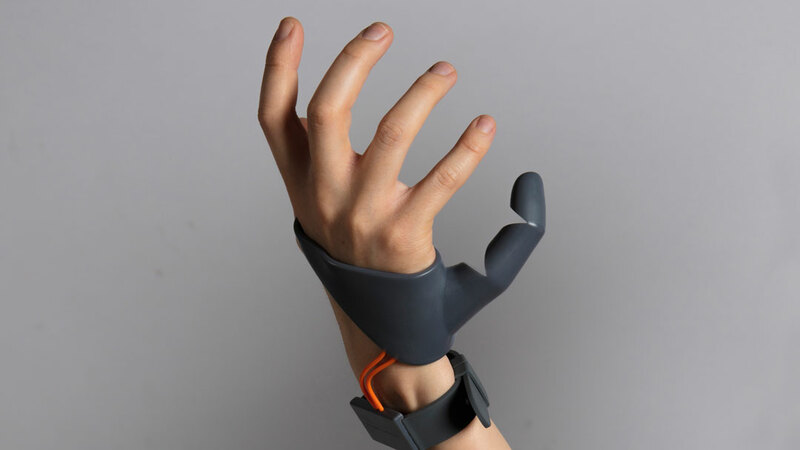 The Third Thumb aims to challenge the perception of prosthetics by becoming a catalyst for society to consider human extension; framed in an approachable, accessible design. It is a tool, an experience, and a form of self-expression. When we start to extend our abilities, and when we reframe prosthetics as extensions, then we start to shift the focus from ‘fixing’ disability, into just extending ability. My main goal with the thumb was to make a ‘living hinge’ design with no interlocking mechanisms, so the movement comes from the design and form of the material. I went through about ten different prototypes in various different materials, before beginning to prototype with NinjaFlex, an 85A shore flexible 3d printed filament. NinjaFlex enabled me to print my thumb design in one piece with the internal cavities needed to control it. Whilst developing the thumb design, I was also prototyping how it attached to the hand. I went through 11 different designs, developing a design that would best fit as many different shaped hands as possible, working out which areas of the hand had the most movement and which had the least. 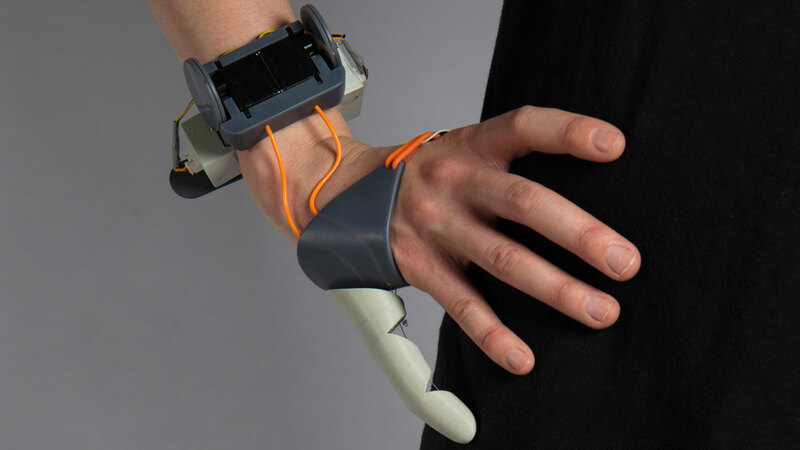 I then combined the most successful prototype of the thumb and the hand piece together and began to integrate the electronics into the wrist mechanism. For the control, I worked on a large research project looking into the flex and stretch of the human body, working out the best possible sensor control point for a new appendage for the body, before concluding with the big toes. 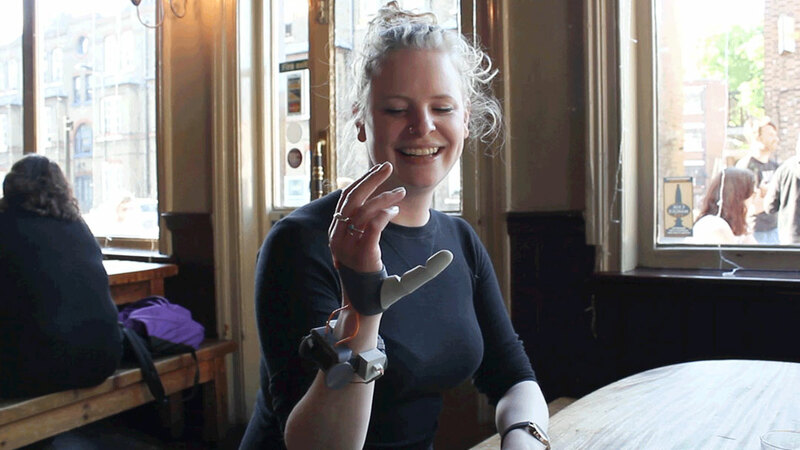 A key part of the project was to experience what it is like to control a prosthetic device, and monitor the shift in emotional attachment to the thumb. It has been a very exciting and unusual experience for everyone who has tried it. The Third Thumb is a reasonably simple mechanism to control, everyone understands it very quickly and is able to easily control it and hold an object after about a minute. When you first experience it, it reacts easily to your movements, but it takes a little bit of time to truly control it slowly and deliberately. 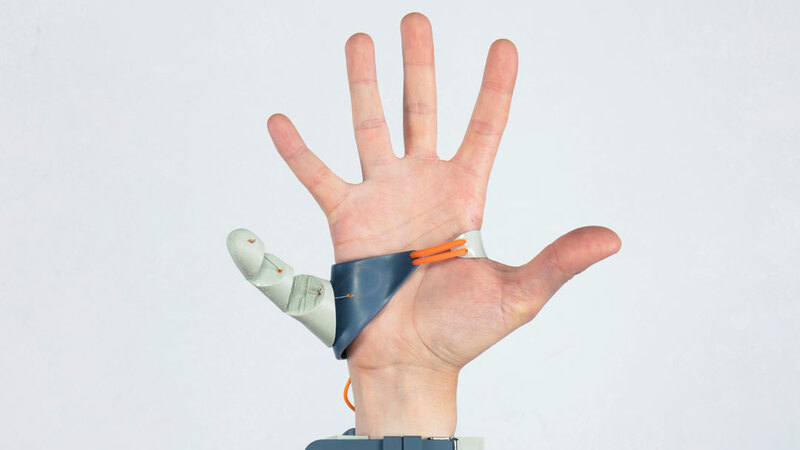 The rigid structure on the hand in combination with the flexible thumb design enables you to feel weight of an object you pick up spread over a part of your hand. After now wearing it for a while, I no longer think about pressing my toe down to move it, I think about bending the thumb and my toe automatically presses down, and because of this I feel as though something is missing when I take it off, hinting to an experience similar to a phantom limb. I was greatly impressed with the concept of the hand “evolving” by increasing the number of fingers, rather than replacing the hand with a prosthetic. The development of tactile design is basically the flipside of the evolution of tactile organs themselves. In all the years of YouFab, we have never seen any other work that has dealt directly with the evolution of organs as much as The Third Thumb. With the evolution of technologies, such as the EEG test used to evaluate electrical activity in the brain, the day will come when the thumb will be able to move like a real finger. And most likely, we will be seeing this in the next few years. This entry is deserving of the HAPTIC DESIGN Award in so many ways. I highly evaluated this works because it stands head and shoulders above the other entries in terms of the fact that it can actually be worn, is a working model, and that it serves to stimulate the tactile sensations of onlookers. I would like to offer the entrant a huge congratulations. 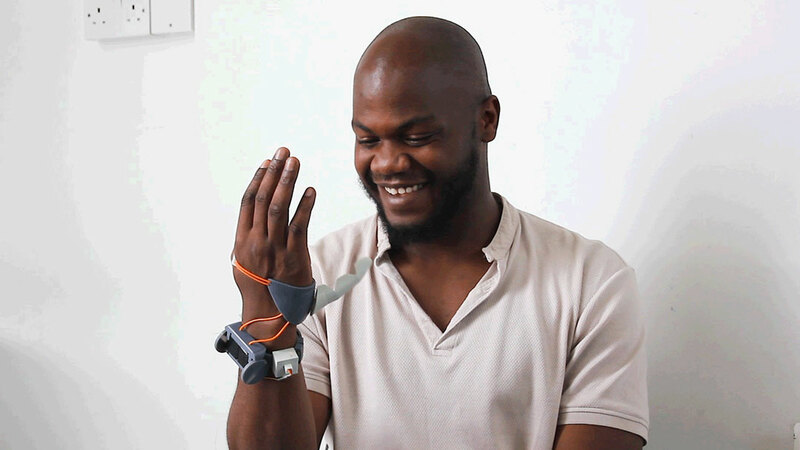 With this extension of the body, I have great expectations for the touch function of the hand itself and the possibility of extending this application to include a variety of other interconnecting senses. I would love the chance to actually try out this works myself.